The Assisted Living Facility at Royal Palm offers personal care for individuals who require assistance with activities of their daily living and not the full service provided by a skilled nursing center. Our facility is staffed around-the-clock, assisting residents with such activities as dressing, and taking medications. Our goal is to allow them to maintain their independence as long as possible, while providing a safe, clean and loving environment. Here is a summary of the services you can expect for your senior loved one to receive from the compassionate staff at Royal Palm Senior Residence. 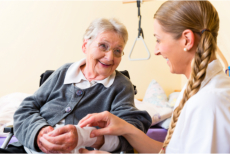 For every resident, we can personalize the care services we provide to ensure that their elderly care needs are met. If your loved one has special requirements to maintain the utmost wellness, please discuss this further when you visit our location or when you call us at 954-491-4041.